Capt. Martin Van Buren Bates, born in Letcher County, Kentucky, and his wife, Anna H. Swan Bates, born in Nova Scotia, were an ideal couple. They each stood at 7ʼ 11-1/5” in height. The couple made their home at Seville, Medina County, Ohio. The public mind has been excited by the wonderful stories about a remarkable couple, said to be the tallest and largest people in the world. So extraordinary were the accounts of these giants that, as it was learned the Capt. 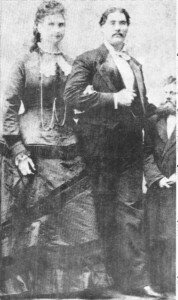 Martin Van Buren Bates and Anna H. Swan Bates were making a tour of the West, a reporter interviewed the gigantic couple and ascertained the truth in regard to them for the benefit of readers. It was no small job, and it must be acknowledged that in all his reportorial experience the writer had never before been detailed to tackle any such weighty subjects. From the reports, it was expected to find two very fleshy people of large stature, so many of whom are advertised as wonders, but who are, in fact, monstrosities, their immense developments being the result of disease. No more fallacious idea could be formed, however, and when the reporter, after having sent in his card was politely ushered into the presence of Captain and Mrs. Bates, he found himself comforted by two as perfectly formed gentlefolks as he had ever seen. The first impression was of awe, and it occurred to the interviewer’s mind that half the truth had not been told. A feeling of insignificance overcame him, and he appeared to sink to the lilliputian dimensions of tiny Jack the giant killer, that historical personage so dear to the juvenile mind. Having recovered from astonishment, the polite and courteous greetings were acknowledged. Captain Bates remarked as he extended his hand, that “he was an admirer of the press,” and he fully demonstrated his affections for it when he allowed his 100 square inches of palm to envelop the insignificant member of its representative. Mrs. Bates received with a stately, courtly bend of the body, learned probably in the halls of royalty, and it is feared that the reporter awkwardly recoiled, as her towering form yielded, from an unconscious fear that something was about to fall on and crush him. But a brief description of these remarkable people must be given in order that some idea may be gained of how they differ from ordinary mortals. Capt. Martin Van Buren Bates was born in Whitesburg, Letcher County, Kentucky, November 9, 1846. He is 7’ 11-1/5” in height and weighs 478 pounds. His father was about six feet tall and his mother was a lady of ordinary stature. He was the youngest of 12 children, seven boys and five girls, and the tallest of his family, except himself, who was a brother killed at Vicksburg during the war, and who was 6’ 2” in height. No cases of extraordinary size have ever been known in any of his ancestors, and his extraordinary developments must be viewed simply as a freak of nature, as it cannot be accounted for on any scientific grounds. Nature, as usual, did not propose to do things by halves, and in 1849 Miss Anna H. Swan was born in Colchester County, Nova Scotia. As the sequel shows, she was intended a champion for the big boy. Her parents were rather small-sized people, her father being but five feet and four inches in height and 145 pounds, while the mother was five feet and two inches, and weighed 110 pounds when in robust health. She had three brothers and five sisters, all of ordinary size, and no other case of remarkable growth has ever been known among her progenitors. Mrs. Bates was as tall as her mother when six years of age, but she continued to shoot upward, and today she is exactly the same height as her husband and weighs 413 pounds. 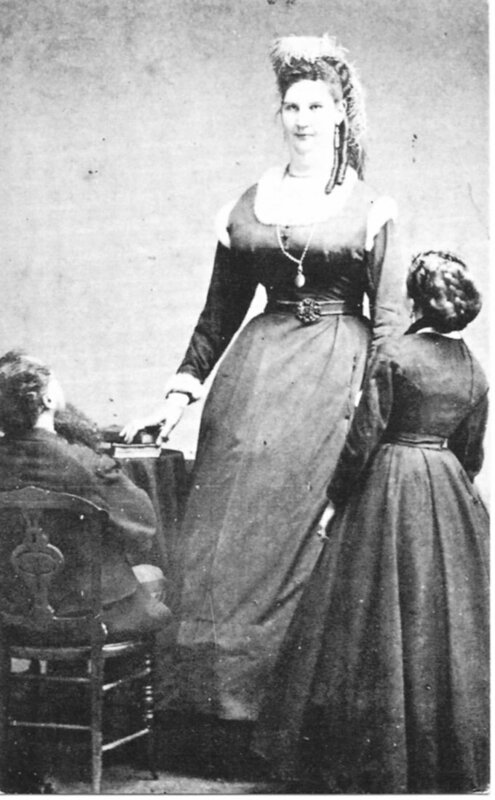 Anna H. Swan Bates, being determined the tallest woman in the world in 1880, was a very elegant and a properly-proportioned lady. It was reported that her exquisite evening gowns were made of 80 yards of silk. In this photo Mrs. Bates is shown standing with a woman and man of average height. Both the lady and gentleman are perfectly proportioned, every member corresponding and aiding to produce a symmetrical but colossal figure. When the reporter called Mrs. Bates, who is an exceedingly fine looking lady, was dressed in handsome blue silk, cut in the most fashionable style, with bands of delicate white lace at the throat and wrists. She wore a quantity of very elegant jewelry, and her hair was dressed high, thus making her appear taller than her stately lord. Captain Bates is a perfect apollo in figure and quite a Chesterfield in manners. He has a frank pleasant face, giving clear indications of the massive heart within him. He affects only a newly-waxed mustache, his broad cheeks giving evidence of a close intimacy with a keen razor. Captain and Mrs. Bates are people of more than average intelligence and show that they have improved the opportunities they have had for acquiring information of people and places during their extended travels. “Do you think you have stopped growing, Captain?” asked the reporter. The reporter did not become too inquisitive, being exceedingly modest, hence he left many questions that suggested themselves for the ladies to ask when they attend the reception in this city. However, he saw a dress boot peeping from under her skirt and mentally decided that it would be called a narrow 12. Reporter: “I beg your pardon, Madame, but did they…. Finish this story and more in our July 2016 issue! Love History? Get 1,100 pages and 1,000 Pictures delivered to your door for a nickel a day! Yes, you read that right, a nickel. Copyright © 2015 Kentucky Explorer Magazine. All Rights Reserved.